Semonto's PulseChecks enable you to keep an eye on a server behind a firewall, a complex NAT situation or a server without an active webserver. Instead of calling and testing your server, your server will ping Semonto frequently. If we don't receive a pulse on time, we will send you a notification. Simple and efficient. Ideal for database servers or to monitor if periodically scripts are running correctly. Database servers are commonly not accessible over the internet. To be able to monitor them it is necessary that these send a pulse to inform that they are still operational. This also allows you to monitor servers behind complex NAT situations. PulseChecks can be used to verify if your cron-jobs have been executed or if periodical back-up tasks are performed. Another usage is for internet of things (IOT) devices to pulse if they are still operational. Semonto has multiple to alert you when a pulse has not been recieved on time or recieved again. Push notifications could be sent to our iOS app, alert you by email or SMS. Semonto can even post a tweet or use a custom webhook. 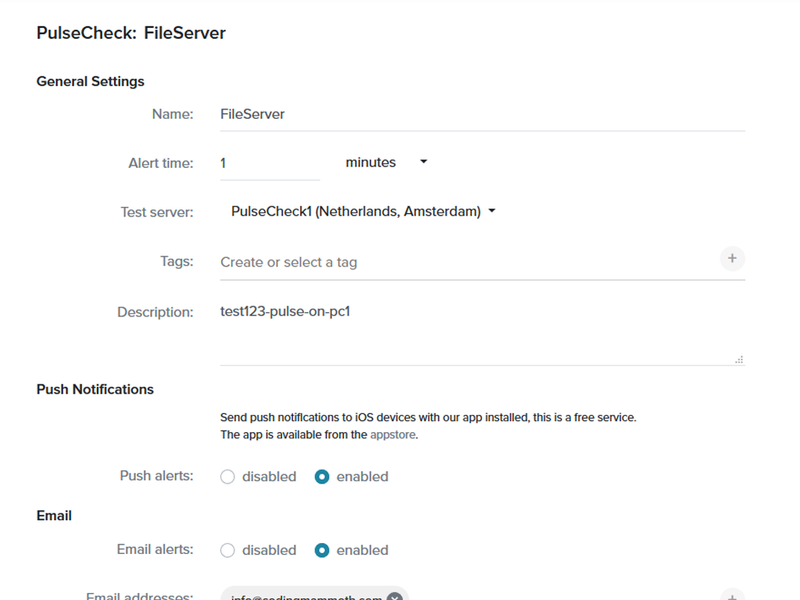 Create a PulseCheck in Semonto Supervisor. For each PulseCheck Semonto generates a unique URL that your server or script needs to call. Make sure your server or periodical script pings Semonto on time, by calling the URL. Once Semonto has received the first pulse of your server, the Pulsecheck is activated. If Semonto does not receive a time before the given timeout, we will alert you. PulseChecks are easy to configure in Semonto Supervisor, the web interface for Semonto. Here you can set the desired time out and define how you would like to be alerted. In order to deliver a high reliability and to reduce latency, we provide multiple servers at different locations to monitor the PulseChecks to offer you the best service.